David Cameron once referred to Gaza as a "prison camp" and "some sort of open-air prison". 1.7million Palestinians are crammed into just 140 square miles; Gaza is one of the most crowded places on earth. Israel, despite withdrawing its troops and settlers from the Strip in 2005, continues to control its airspace, territorial waters and border crossings (with the exception, of course, of Gaza's land border with Egypt). Remember: according to the Israeli human-rights group B'Tselem, in the last major conflict between Israel and Hamas - 'Operation Cast Lead' which kicked off in December 2008 - 762 Palestinian civilians were killed, including more than 300 children, compared to three (yes, three!) Israeli civilians. We seem to be seeing a similar imbalance in bloodshed this time round: "More Palestinians were killed in Gaza [on Wednesday] than Israelis have been killed by projectile fire from Gaza in the past three years," wrote Palestinian-American activist Yousef Munayyer on the Daily Beast website. Most international lawyers, as well as the International Committee of the Red Cross (ICRC), consider the blockade to be illegal under international humanitarian law; in 2009, a UN panel, led by distinguished South African judge and self-confessed Zionist Richard Goldstone, accused Israel of imposing "a blockade which amounted to collective punishment". In 2006, Dov Weissglass, the then chief of staff to Israeli prime minister Ariel Sharon summed up his government's approach to Gaza and its residents when he confessed: "The idea is to put the Palestinians on a diet, but not to make them die of hunger." A rhetorical flourish? Not quite: in 2008, Israeli defence officials in charge of restricting food and supplies from entering Gaza went so far "as to calculate how many calories would be needed to avert a humanitarian disaster in the impoverished Palestinian territory, according to a... declassified military document." Some 10% of children under five in the Gaza Strip have had their growth stunted due to prolonged exposure to malnutrition. "Stunting (chronic malnutrition) is not improving and may be deteriorating," concluded the World Health Organisation in May of this year. The unemployment rate in Gaza is 28% - and stands at 58% among young people aged between 20 and 24, according to the Palestinian Central Bureau of Statistics. 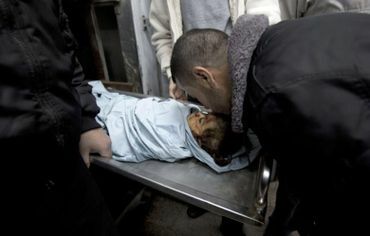 The escalation of the violence this week was prompted by Israeli's assassination-by-drone of Hamas military commander Ahmed al-Jabari; the IDF said Jabari was a terrorist with "blood on his hands". Yet, as Aluf Benn, editor-in-chief of the Israeli newspaper Ha'aretz, pointed out: "Ahmed Jabari was a subcontractor, in charge of maintaining Israel's security in Gaza... Israel demanded of Hamas that it observe the truce in the south and enforce it on the multiplicity of armed organizations in the Gaza Strip. The man responsible for carrying out this policy was Ahmed Jabari... Jabari was also Israel's partner in the negotiations for the release of Gilad Shalit; it was he who ensured the captive soldier's welfare and safety, and it was he who saw to Shalit's return home last fall." According to Israeli peace activist Gershon Baskin, Jabari was the "key actor on the Hamas side" responsible for keeping calm inside the Strip and the official who would "force" ceasefires "on all of the other factions and on Hamas". Good job, IDF! Two out of three Palestinian residents of Gaza - more than a million people! - identify themselves as refugees; the majority of these are 1948, and not 1967, refugees - that is, they fled to the Strip in the "ethnic cleansing" of 1948 and not the Six Day War and subsequent occupation of 1967. Thus, tragically, even a two-state solution.